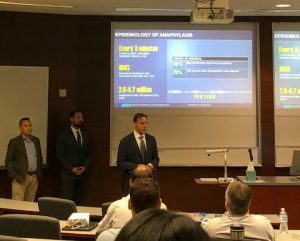 Culminating a successful year of learning and growing, the most recent Rady School of Management Lab to Market FlexWeekend 2018 cohort wrapped up its final class with a pitch presentation event highlighting the top three teams of the cohort. The signature Rady School course sequence exposes students to every step of the entrepreneurial process, from idea development to compiling a go-to market strategy, culminating in the presentations as the capstone course. Over the yearlong sequence, 12 teams were launched with companies ranging from medical diagnostic development to patient advocacy software. 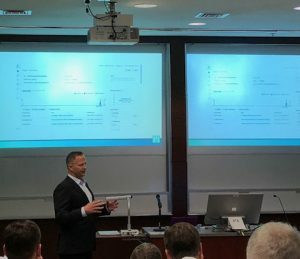 The top three teams were recently selected to pitch in front of a panel of experts to showcase the high caliber entrepreneurial efforts of the graduating cohort. Panel experts included Tim Rueth, an Entrepreneur-in-Residence at UC San Diego and investor; Greg Horowitt, a co-founder and managing director at T2 Venture Capital; Richard E. Campbell, a partner at Procopio; Gioia Messenger, a serial entrepreneur and CEO of Avaak Inc.; and Robert Sullivan, Dean of the Rady School of Management. The three teams selected to pitch in the Lab to Market finals — Akira, Beggy and mezhAir — displayed the diverse talents of the graduating cohort. Akira was the first team to pitch at the event. The medical diagnostic industry is booming, and a group of Rady School students are developing the next big thing – microneedle technology for drug delivery. Akira, developed by Shamal Mehta (MBA ’18), Ph.D. and Christpher Westropp (MBA ’18), M.D., has come up with a solution similar to the EpiPen to treat severe allergic reactions and drug overdoses. The Akira technology is painless, cheaper to produce and less susceptible to user error. Inspired by being a working mother on the go, Rady School graduate Suvi Tanninen (MBA ’18) developed Beggy, a stylish and functional “smart” purse with wireless charging capabilities. The purse is designed to be customizable to fit the needs of each customer with inserts designed to charge a number of electronics, as well as a rechargeable battery fitted at the bottom of the purse to ensure connectivity. The final group to present was mezhAir, a system that measures the amount of a microscopic and harmful pollutant, PM 2.5. Recent research indicates that excessive levels of the pollutant can lead to a number of respiratory problems and lung cancer. Colin Lober (MBA ’18) and John Walsh’s (MBA ’18) company mezhAir created a way to measure the level of PM 2.5 in a space, bringing awareness to the pollutant and encouraging solutions to eradicate the issue. After each presentation, the panelists provided valuable feedback to the teams on potential product improvements, suggestions for reaching larger audiences and advice on how to address potential entrepreneurial pitfalls. Although the Lab to Market sequence has come to an end for the FlexWeekend 2018 cohort, the marketability and profitability of their companies has inspired the recent graduates to continue working on their projects. Del Foit, a lecturer at the Rady School of Management, shared his satisfaction with the recent graduated cohort.